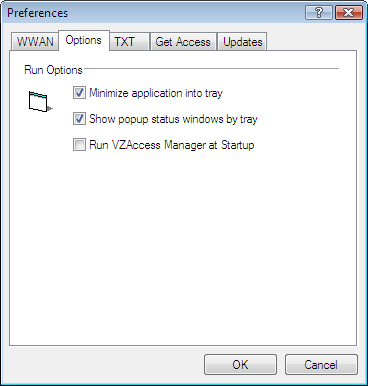 VZAccess Manager software must be installed before inserting/connecting the device to the computer for the first time. Select the Options tab to view the available Run Options. Ensure desired options are selected (checked) then select the next desired tab or click OK.
App is minimized upon connection. Connection status notification is visible above the System Tray.